Back to school! Its that time of year that makes moms happy and sad; happy to start new routines and sad about the energy and organization it can take to get your family going. Throughout the month of August we are featuring organized moms who will help get you started back to school with the toughest tasks. 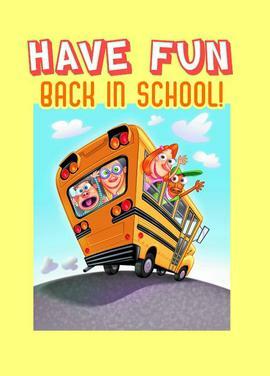 Here is an post for the families where no one in your home is going back to school. For some of us, no one in our households are heading back to school. However, preparing for a new school year has been such a deeply engrained experience in our lives that it’s hard not to find yourself browsing for school supplies. I use this time of year to regroup after the summer and gather my wits before the holiday season gets into high gear. Why let school kids have all the fun? New Clothes. With sales on clothes, it’s a good time to pick up summer clothes on sale and preview the fall fashions. I use this time of year to assess what summer clothes are leaving and what items I need for the fall and winter. If I didn’t have my coats and jackets cleaned before the temperatures rose, it’s a good time to get those cleaned before you need them. For me, I will be shopping for new boots. Last year, I wore my kicky black boots until they were literally falling apart, and they’re beyond repair. I’ve already perused a few fall catalogs. School Supplies. We never really outgrow school supplies. Because school supplies are readily available, it’s a good time to restock sticky notes, pens, notepads, and my personal favorite – Sharpie markers. Giving Back. I remember the thrill of having new school supplies, and I also remember the times when we didn’t have new things because money was tight. The parents of my nieces and nephews always take care of their school supplies, and I don’t need to buy any for them. Instead, I pick out a fun backpack and fill it with school supplies for a back-to-school drive. The Holidays. Yes, I know it’s August, but I do start thinking about the holidays early, especially since my parents are saying they’re coming for Thanksgiving this year. I made a list of house projects I want completed before the parents pull into the driveway. I also make my holiday list and jot down the interests and ideas I have for my nieces and nephews. Janice Simon is owner of ClutterPrincess.com. She enjoys writing, organizing, dark chocolate, time with her nieces and nephews, and action movies. Thanks to ABC13 for the opportunity to make a difference this fall for Back To School. The school year is about to start and that means a massive influx of papers! 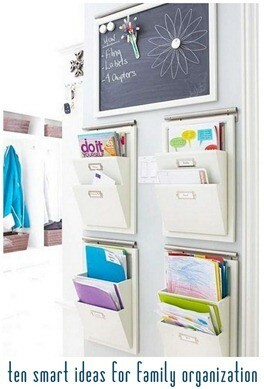 Here are some ideas that moms are using to keep up with the paper flow. I keep a basket by the door and the kiddos drop all their work in there daily. I look through for 5 minutes to see what needs to be returned and get it back in their backpacks right away. The rest stays in the basket about a month and then we review it together. My kids love to send papers off to their grandparents in other states and I write a small note on them that they dictate before I send them. I love having a small box on my desk for each child’s work. This way I have them drop their papers into the box. Once a week I go through it with them, just to review their work. I have found that sometimes I need to refer back to it, so I keep a larger box in their closets to keep the papers for a while. At the end of the year I go through and use boxes from IKEA to keep them in a manageable amount. It saves time to see the papers all together to know what to keep. Ellen encouraged me to have a command center with a hanging file for each child. This way I can drop papers in when they come home from school and not lose them. I have them ready to sign when I need to also. My kids are high schoolers so they have their papers together in their notebooks and we just check grades weekly and print these out. The way that I’m able to control the huge amounts of school papers that come home is to deal with it swiftly! Often a week’s worth of school work comes home all at once and my daughter’s backpack is jammed full – some are treasures and some are just plain old worksheets that no one will miss. We go through the stack with Daddy because she loves to show off her work to him and he enjoys keeping up with what she’s learning. As we look through her work, I set aside anything that seems extra special. Everything else gets tossed*. The keepers go in a large portfolio case in her closet and are alligator clipped by grade. * It’s best to get rid of the excess schoolwork when kiddos aren’t watching! Out of sight, out of mind – but if they happen to see it get thrown away, sometimes they get sad, especially my toddler! Still have last year’s papers? Take time now to knock this out! What’s your best paper strategy? It’s the little things that count! Take one of these tidbits and make it your own, getting it done in your own way, to get started on your way to total organization. 1. Go to bed at a regular time. Getting a good night’s rest means you can get up rested and ready to tackle the day. 2. Get up a smidge earlier than the rest of your clan. Your time is your own and you can get more done. It’s the best time for ME time! 3. Get ready the night before. There is never enough time in the morning. Lots of things go wrong in the morning. Have your bag, your kids bag and any other stuff together at night. Get your clothes together too. 4. Get a plan for meals in and out of your home. There are so many ways to get dinner done, groceries purchased and a plan in place. Having a plan also helps you save money. Have fun with this on pinterest, allrecipes or just by having your family cook with you. 5. Get help with the hard stuff of laundry and dishes. Have a time set aside every day to have both of these completed well before bedtime. It may not be as fun as you like, but add incentives and partnerships so that it gets done. Set a timer to just get laundry put away and dishes in the dishwasher in the evening. In the morning, set that timer again to get the laundry started and the dishwasher unloaded. Have a chores chart to share the responsibilities. 6. Have a morning and evening routine for you and your kids. Use checklists so that everyone knows what to do next and what is expected. Have clocks in the kitchen, bathrooms, and landing strip so that you can keep on time for these routines too. 7. Have a designated spot for your and your family’s stuff. Every evening get the stuff back to where it belongs. If the stuff is already overflowing, set a time to just work on that one area to get it back to a manageable amount in that spot. 8. Keep your car organized by dumping the trash while getting gas. Our cars get just as disorganized as our homes. Take only the papers into your home that are required, not just in case. 9. Write out your 3 most important tasks (MITs) for the next day the night before. Having a clear focus on what to do first makes the day more productive. 10. Keep your calendar up to date. When asked about an activity, just share, “I have to check”. 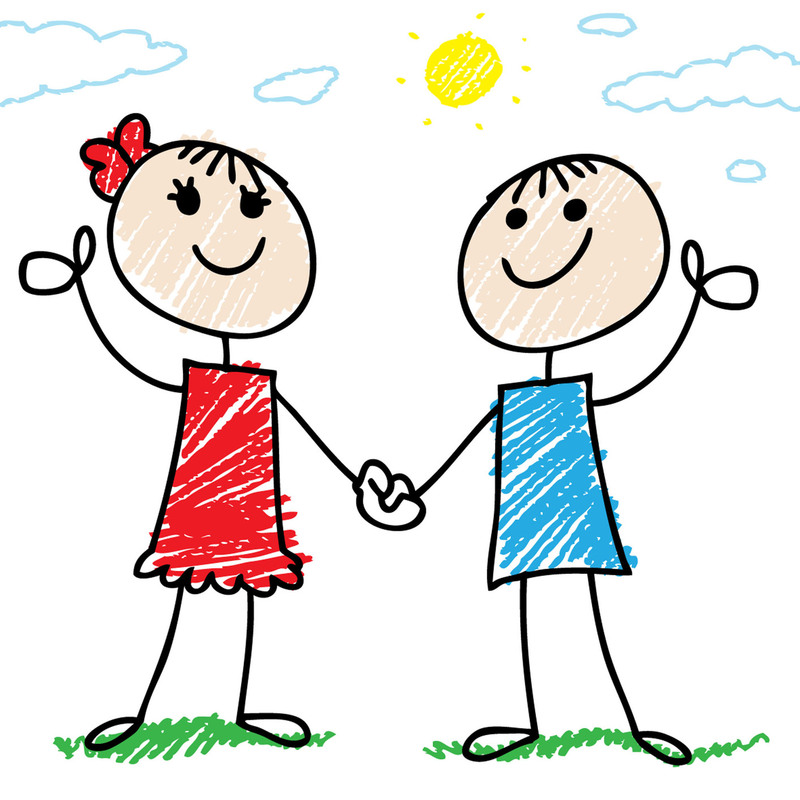 That way you are making a plan before you add new activities for you and your kids. Moms are challenged to get everyone to do their part for family responsibilities and chores. Getting everyone to pitch in makes a difference. Chores at our house became more of a chore to discuss and get our son to do than an asset to our family time. The arguing and nagging were non-stop. To get over our hump, as I knew things would only get worse without instilling a sense of pride and ownership into our house for our son (3 at the time, currently 5 1/2), I began with a family meeting regarding expectations. My husband had his jobs, I had my jobs, and our son was assigned his job(s). We began with small tasks for our little man. His first: putting away his clothes. Not all of his clothes, but ones that didn’t really matter if they got wrinkled or not, like underwear or socks. Each time he did it without complaining, he got to pick a sticker from the pack (we went to the store and stocked up on stickers that he picked out prior to doing this). When he got 5 stickers, he got a reward. Each category of our sticker chart had a pre-determined reward for filling in all sections. After a week or two, we increased his load and ours. (Of course, we described our jobs in more detail instead of adding more things for us to do. For example, instead of “cleaning house”, it became “cleaning floors and vacuuming” for me and “outside chores” because “mowing and weed eating” for my husband.) He started putting away his clothes AND putting out the napkins on the table for each meal. Again, we followed thru with the sticker chart. We kept it on the fridge so that it was a reminder to him AND us to use. Consistency regarding the chart is what made this successful. When I forgot to fill it in, he reminded me. As he became more experienced and older, we increased his load even more. Additionally, instead of getting stickers, he now gets an allowance ($3 a week). He saves him money for things he wants to buy. His chores now consist of: putting all of his clothes away, matching the clean socks, picking up his room each night before getting ready for bed, setting the table for all meals, clearing the table after all meals, unloading the tupperware and silverware from the dishwasher, and washing or drying dishes (whichever would be easiest for him to do based on the dishes…we avoid him handling knives and glass as much as possible). If he helps clean the bathroom (I spray the chemicals, he wipes), he gets 50 cents. If he helps clean the floors (yes, that includes sweeping and mopping), he gets 50 cents. If there is an extra family task (planting a tree, weeding the flowers, painting the porch, going through clothes, etc.) he has the opportunity to earn additional money (usually $1-$5) depending on the expectation of the outcome for the job’s difficulty level. On a side note, we switched to money instead of toy rewards because it was getting expensive. As an added bonus, he is now learning the value of money. Sometimes he requests 4 quarters instead of a one dollar bill, for example. Here is the important part: ALL (not just a few and not just randomly) responsibilities need to be completed the first time asked AND without an argument to receive his allowance. That means that if he does a great job all week but blows it over the weekend, he gets no allowance…not even part of it. Seems harsh, right? I thought so at first, but it is way worth it. That was a challenge for him at the beginning, but after a few times of not getting his allowance, he knew we meant business. The payoff of outlasting his behavior to show him we mean business, way out weighs giving into his fits for his allowance. I didn’t threat to not pay him and then give him a partial amount. What would I be teaching him? This: it’s ok to throw fits to get what you want, you can do things in a half hearted way and get rewarded, the child makes the rules not the parent. That’s not how it works. I am the parent. He is the child. I am teaching a lifelong skill of self respect, self discipline, following directions, respecting adults, doing things because the need to get done, etc. This is a black and white issue for us. Either he will learn to take responsibility and become a responsible citizen or not. Tiffani Collins is a 7th grade math teacher with one son. She enjoys spending time with her family and her dog Spartan, and especially family game night. 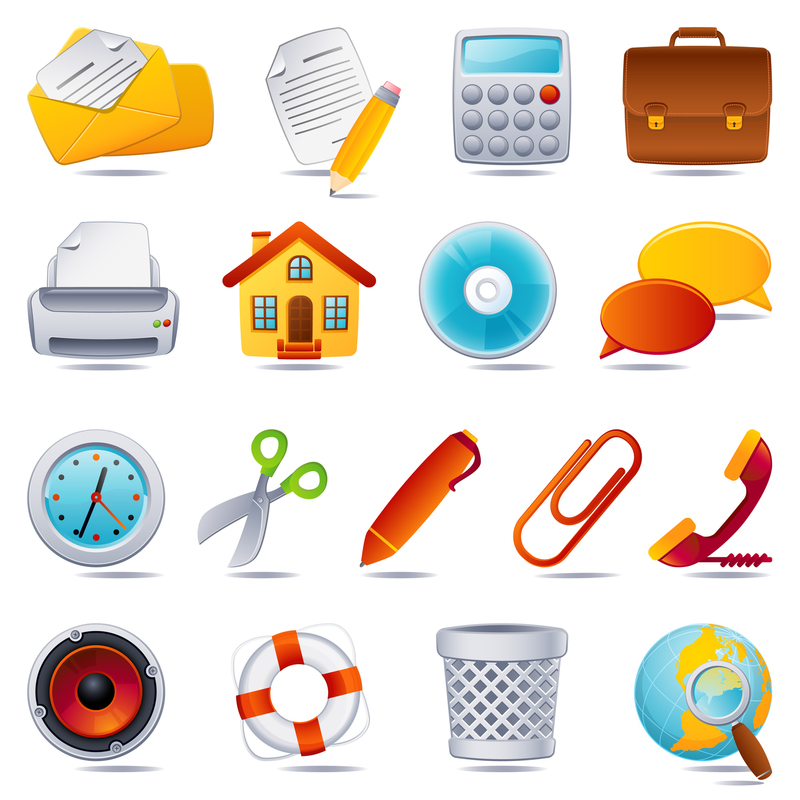 Are you avoiding your home office because it is cluttered with paper, extra junk, set up poorly or overwhelming? Busy lives demand efficient ways to work productively in your home office. Join Certified Professional Organizer and Family Manager Coach Ellen Delap to learn tools and techniques for organizing your files, establishing productive processes and arranging your space for maximum effectively. Ellen will also share products that will make a difference. Leave with a plan for your home! I am thrilled to share Back To School Success Strategies with our Houston community! Moms are challenged by making lunch nutritious, easy to make, and enjoyable for their kids. Here are some solutions for you. Instead of a sandwich, I had the deli counter cut lunch meat in one thick slice, which I then cubed and packed with cubed cheese, toothpicks, and crackers. (Toothpicks are huge with my kids—maybe because I have three boys—they love when I condone the stabbing of anything) Wraps are another hit—the same ingredients as a boring sandwich, but wrapped in a tortilla—I spread cream cheese or Laughing Cow Swiss, then the lunchmeat, shredded cheese and “salad” (my boys’ term for lettuce, spinach, etc). I am sure the “salad” gets brushed off immediately at school, but I try! Also, varying the bread on a basic sandwich was a hit. We used thin bagels, English muffins, and even corn muffins. Other main dishes include hummus with pita chips and carrots, cold pizza, cold pepperoni rolls, and leftover meatballs (again with toothpicks). If you have a thermos, baked potatoes, soup, or any pasta can be a great change on a cooler day. Of course, I always add a fruit and small treat to brighten their day. Shawna McGrath is a stay at home mom of three boys, part time Math and English tutor, and enjoys believing her kids eat all the food in their lunch, not just the cookies. 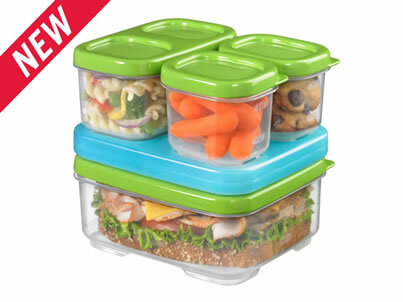 Pictured above is the all new Rubbermaid lunch kit named LunchBlox. As a mom and Gigi (grandmother), I love the gift of LuncBlox from Rubbermaid! As an organizer, lots of rectangular containers in bright colors make a difference. Little separate compartments for different items and an ice block to keep it all cold make it easy to keep lunch together and make it the night before. It’s also BPA free and dish washer safe. All of Shawna’s suggestions will fit in the new LunchBlox. Making lunch will be so much more fun, nutritious and enjoyable now! What lunch will you pack in your LunchBlox? Certified Professional Organizer Ellen Delap is a fan of all sorts of containers!